If you are running a business and you do NOT have dedicated marketing support, the Create Launch Profit eSubscription Box is created for you! What is Create Launch Profit? Fill in the blank, done for you marketing templates to copy, paste and convert fans into customers. 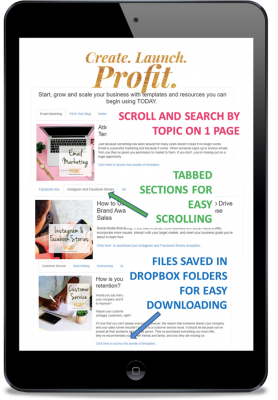 Create Launch Profit is a monthly set of themed marketing templates. For small business owners doing it all, bombarded with too much to do and not enough time to do it. 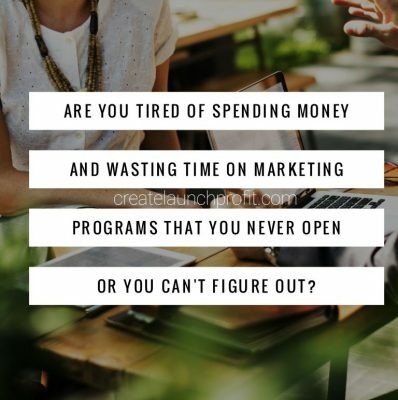 For only $47 per month, get your systems up and running, to automate as much of your marketing as you can, free up some time, and make you (or your assistant) more efficient. There are limitless ways you can incorporate the tools and templates included in each monthly package. Let’s just look at a few of the ways you can use your subscription to help you CREATE and LAUNCH the products and services you want, to get your most PROFITABLE results. If you’re a solopreneur making IT happen all by your lonesome, you will save a ton of hours from creating these systems from scratch. If you have a VA (or you’re ready to hire one), you will have something already structured and organized to hand off, so you don’t waste hours paying the VA to research how to create this stuff! You can complete the templates with your customized business info, and tell your VA what to do with the info. Join us the Create Launch Profit eSubscription Box for only $47/month. This my friend, is your systemization done-for-you! You can use these templates to create canned responses for email inquiries, standard templates for blog posts, webinar scripts, and the like… You don’t have to reinvent the wheel and start from scratch. Simply customize and automate.